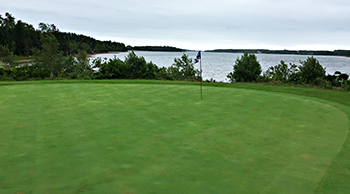 Opening in 1999 at the Rodd Brudenell River Resort on the east side of Prince Edward Island, Dundarave golf course is regarded as the more challenging of the resort's two 18-hole layouts, though it must be noted that the Brudenell River course is also a fine test of golf. Expansive, tree-lined fairways at Dundarave lead to large, cleverly contoured greens protected by red sanded bunkers of various shapes and sizes and the 18 holes meander through some of the most stunning terrain on the island. The fairways have been carved through acres of pine forest so golfers stand on every tee box isolated from the rest of the course. Don’t think the trees completely negate the effects of an ever-prevalent wind, however, as many of the greens are laid out on exposed sites beside the Brudenell River where unexpected gusts can suddenly whip in off the water. The course hosted the inaugural Making the Connection Legends of Golf match in 2006 between Jack Nicklaus and Tom Watson when the golfing giants renewed their “duel in the sun” rivalry as part of a promotion to raise cholesterol awareness and reduce the likelihood of heart disease and stroke. "Dana, Jason Straka and I worked on this project, and when time got short and we needed more supervisors we called in Guy Quattrocchi. Robbie Hellstrom… again did what we thought was impossible – complete a golf course complex in less than five and a half months. Robbie showed what he could do at Mt Tremblant when he was the project coordinator for the Diable course so he was hired again to repeat the trick. The Dundarave site was adjacent to the existing Brudenell River course in the Rodd’s Brudenell River Resort. The first step was to decide upon a clubhouse site and one was selected to serve both courses. This meant that the Dundarave course could not have returning nines because of space limitions. This turned out to be fortunate, for it meant the golf course could could be routed further out onto the site, taking advantage of its most exciting parts. The result is four distict types of golf – links, heathland, coastal and inland. Some holes play in open meadow, another section is in woods, a stretch wind along the river’s edge and several holes run up and down hills and skirt pond and wetlands. The clay soils of PEI are very red owing to their high iron content and even the bunker sand is tainted red. Draining those clay soils became the biggest chllenge and the most costly part of the construction. The contractor was an islander named Harry Annear, whose company did a remarkable job working in difficult site conditions." Dundarave is located in a very charming area of eastern Prince Edward Island. Amazingly, it was routed through an old existing course, Brudenell River, and the result was very good. Three of the holes play along an inlet and are the signature holes of the course. But, the inland holes are also very strong. The course was fair, allowing for aggressive and conservative options. A nice feature are the red sand bunkers. However, in many cases, because of the compacted sand/soil in the bunkers, the ball simply ran through them. Can’t complain. A solid course for a great price. The best course on the Island.